If you look around for the term Middleware, you will see it being used widely but unfortunately not explained properly anywhere. 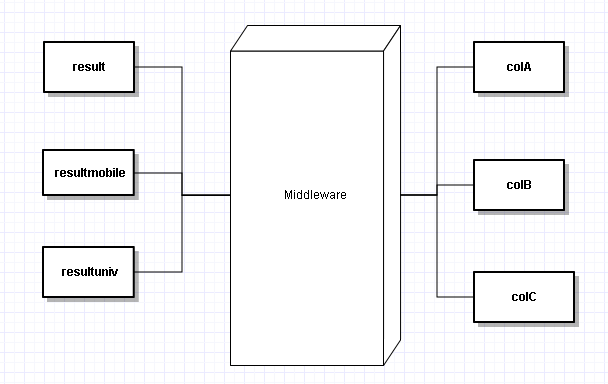 What is middleware? If you are working on simple web applications, the possibility is that you have mostly worked on client-server paradigm without worrying about middleware concepts. Middleware genrally comes into picture when we are dealing with multiple(atleast 2) applications. It helps these applications talk to each other, even if these applications are on different platforms, technologies and servers. How does Middleware do it? Lets take a simple example. We have a college A, which has an inhouse application (colA app), used to track students data, attendence, results etc. Now there is an internet application which is supposed to display results of students online (result.com). Now result.com app needs to communicate to colA app to fetch student result data. We introduce a middleware application which helps these 2 app communicate. Let’s say this is message oriented middleware, so as soon as a new result is available on colA app, it writes it on a queue of middleware app. Now middleware might do some processing on the data if required and add it to another queue, which is listened to by result app. Why can’t result app directly talk to colA app? It can, but what will happen if complexity increases and we introduce many new applications into the arena. Say we have hundereds of colleges and tens of result apps. And to complicate it further, college apps also need to communicate to each other. Just imagine the comexity that each app is listening to tens of other apps and fetching data from tens of apps. Each app need to worry about security, concurrency, connectivity, handling so much load. Different apps might be using different technologies to make the communication difficult. With introduction of middleware, we are moving all the complexity out of the apps so that they can focus on their core areas and let middleware worry about handling load, setting up clustors, managing security, dealing with different technologies and platforms. This entry was posted in Interview Questions, Java, Software Engineering, System Design and documentation and tagged Interview Questions, Java on July 23, 2013 by admin.